1/12 Les Winan Just fantastic filmmaking. Great cast for the thinking man's populist director. 2/123 David Mumpower Redefines science fiction for the next decade in the same way The Matrix did in 1999. 2/190 Max Braden Leave it to Christopher Nolan to deliver something wickedly creative, or at least demonstrate how most everything else is middle of the road. Tom Hardy was excellent casting here. It takes a lot to get an original idea out there these days, especially in a summer season that's filled with adaptations and sequels. 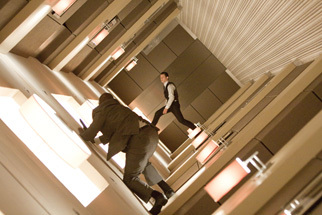 Among these, Inception stands out like, well, what's the opposite of a sore thumb? It's got such an embarrassment of riches that it's hard to pick the main reason we're excited about it. I mean, you had us at Chris Nolan. You had us at a cast that includes Leo, Ellen Page, Cillian Murphy and Joseph Gordon-Levitt. You had us at secrecy and bizarre, gravity defying fight scenes. And you had us at that amazing trailer, which seems to warp space and time in a way that I don't think we've ever really seen before. Basically, Nolan can do what he wants with us, as long as he promises to still respect us in the morning. See the latest developments for this project on the Inception Movie News page.